If you are using Wifi or wired Ethernet to connect to the Internet, you would have come across a warning showing “Limited or no connectivity” or “No Internet access” in Windows 10 or also in Windows 8/8.1. Most of the times this is legitimate and shows that the network is connected while the computer can’t connect to the Internet. But sometimes this can be a false positive. In this article we will discuss some scenarios to fix limited or no connectivity error in Windows 10. You can directly open the Network Connections by Run –> ncpa.cpl. Double click the connection you want to check. Make sure everything is set to DHCP (If you are using DHCP in your network). Otherwise check your static configuration. You should especially check the DNS configuration. 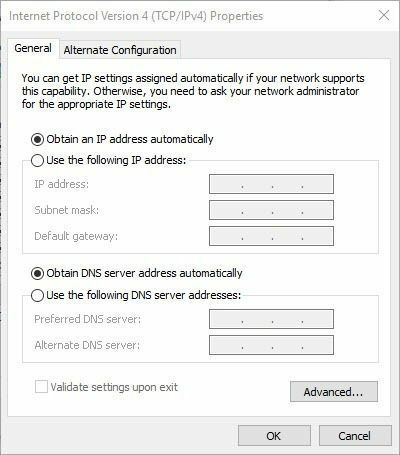 Change the DNS IPs to 8.8.4.4 and 8.8.8.8 (Google DNS) and check if you get rid of the limited connectivity error. This should reset the winsock to a clean state. Now restart your computer and check if your problem has been resolved. This should fix your limited or no connectivity error in Windows 10. The same commands can be used for Windows 8 and even Windows 7. Please let us know if you are still having problems. We’ll dig down the problem for a unique solution for you. Excellent guide. Helped me sort out a DNS issue in a critical situation. 5 stars! After the recent update to Windows 10 version 1709, my system was not getting any IP address using DHCP. I was forced to give the IP address manually to make the Wifi working. After your suggestions, my system is receiving the IP address through DHCP successfully. Thank you for a wonderful fix. Hey. Is this also work on Windows 8 64bit? Thanks. It’s a great site.